With collaborators and friends Professors Beth Osnes (Theatre and Dance) and Max Boykoff (Environmental Studies) we have formed an organization we call Inside the Greenhouse. Please check out our web site to learn more about our outreach efforts in creative climate communication as well as free public events which showcase student and professional work in this area! At the end of the field season, we invite all of the landowners whose property we work on (night and day!) 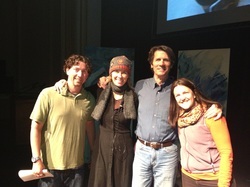 for an informal collection of talks about our field research. Check out the birds while you wait for or ride the bus! 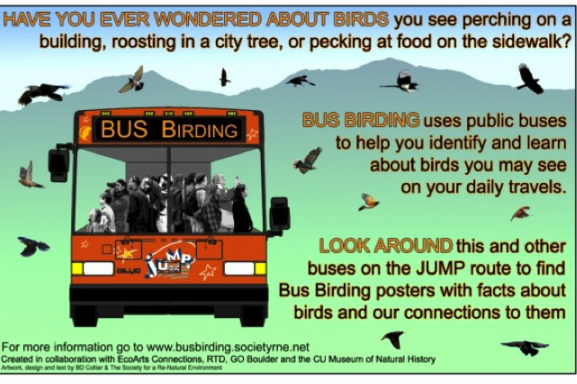 Our group participated in the 'bus birding program' as a founding member and even established a 'swallow stop' where bus riders could get off the bus and come see us do our work! Audrey and Joey provide a lesson about barn swallows and demonstration of how to check nests for a local children's camp. The campers later created their own mud nests from clay and sticks.